NashNoize CMA Fest Edition to be held at the Tin Roof Broadway on Thursday, June 7th during the 2018 CMA Music Festival! 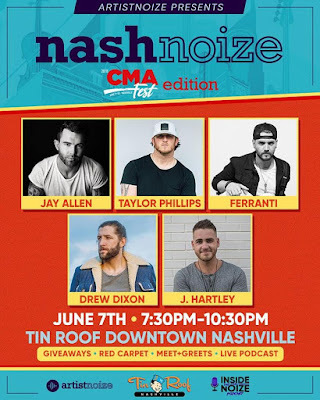 This event will showcase some of the hottest new country artists including: Jay Allen, Taylor Phillips, Ferranti, Drew Dixon, and J. Hartley. The event will feature a red carpet, meet and greets, and giveaways!